Real property transfers are governed by Chapter 442 of the Missouri Revised Statutes. Quitclaim deeds, however, are not specifically defined in the statutes. Quitclaim deeds are used to transfer the rights, title, and interest in real estate from the grantor (seller) to the grantee (buyer) without any warranty of title. When using a quitclaim deed, there may be potential unknown claims or restrictions on the title, and the buyer accepts the risk, effectively taking the title as-is. These deeds are frequently used in instances such as a divorce, with one spouse signing all of his or her rights in a piece of real property over to the other spouse; when there is uncertainty about the history of the property's title; or when a current owner or buyer wishes another party with interest in the property to disclaim that interest. 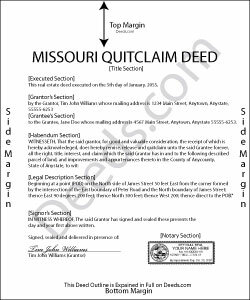 A lawful quitclaim deed includes the names and addresses of each grantor and grantee, and a complete legal description of the property (59.310, RSMo). Include the preparer's name, address, and signature as well. Besides these requirements, the form must meet all state and local standards for recorded documents. All recorded documents or documents affecting a change in property ownership must contain information on how the property will be vested. For Missouri residential property, the primary methods for holding title are tenancy in common, joint tenancy, and tenancy by the entirety. A grant of ownership of real estate to two or more unmarried persons is presumed to create a tenancy in common, unless otherwise stated in the conveyance. Real property conveyed to a married couple vests as tenancy by the entirety (442.450, RSMo). Include all relevant documents, affidavits, forms, and fees along with the deed for recording. Jackson County, St. Louis County, the City of St. Louis, and St. Charles County each have their own Real Property Certificate of Value. File this form with the deed at the time of recording. In Missouri, the grantor must sign the deed in the presence of a notary public before presenting it to the county recorder. In the City of St. Louis, both the grantor and grantee must sign the deed. Recording the deed preserves a clear chain of ownership history and provides public notice. An unrecorded quitclaim deed in writing will be valid between the parties to it and those that have actual notice of it (442.400). Submit all deeds to the local county clerk's office of the county in which the property conveyed is located. This article is provided for informational purposes only and is not a substitute for legal advice. Contact a lawyer with questions about quitclaim deeds or any other issues related to the transfer of real property in Missouri. ALAN C. said: Everything was as advertised, and easily downloaded.